Can Custom Design, Size, Colour or Logo Printing. The Human Bowling Alley is a high adrenaline gaming zone that provides just as much entertainment for guests as it does the users. 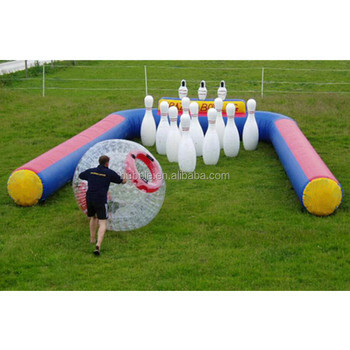 The aim of the game is for you to team up in to groups and play a real life game of oversized human bowling. The players take it in turn to climb inside the bowling ball, strap themselves in & be pushed down the inflatable alley by our fully trained staff, knocking as many of the skittles down as they can in the process. The winner of the game will be the group who scores the most points at the end of the rounds. Extra points will be awarded strikes & half strikes. The usage and the groups can be moulded to suit your event specifically. A: 1). Please specify the items and order quantity you need with any special requirements if you have. 2). We will quote you best price with details accordingly. 3). If you confirm the order, we will make Proforma Invoice with order details and payment conditions. A: We accept payment by T/T (bank wire transfer), Western Union, Money Gram, Paypal, Secure Payment or Trade Assurance. 30% deposit, balance after production (we will take pictures or videos for confirmation). Q: When will you arrange production and shipment? A: We will start production as soon as we receive your down payment (deposit) or payment slip/copy. After production is completed, we will blow up the products for quality control and email you photos for confirmation and check if any modification is required. We also welcome your visit and inspection. We will make shipment and send you shipping documents as soon as we receive the balance payment. A: Production time for an order usually takes 10- 20 days upon receipt of deposit. However, it can be longer or shorter time, depending on design (big or small size, simple or complicated, in stock or not), order quantity (big or small), time frame when you place order (busy season or low season), etc. A: Can be shipped by sea, by air or express delivery. Actual shipping time depends on which seaport, airport and delivery address you use. A: Please tell us the items, quantity (weight& volume) and port of delivery (address), so we check with shipping company and quote you best price with details.